The skin is the largest organ of the body, serving as an important barrier between the internal milieu and the external environment. The skin is also one of the first lines of defense against microbial infection and other hazards, and thus, the skin has important immune functions. This organ is composed of many cell types, including immune-active dendritic cells (epidermal Langerhans cells and dermal dendritic cells), connective tissue-generating dermal fibroblasts and pigment-producing melanocytes. Comprising the outer skin layer are the epidermal keratinocytes, the predominant cell of this layer, the epidermis, which provides both a mechanical barrier and a water-permeability barrier. Recent data suggest that aquaporins, a family of barrel-shaped proteins surrounding internal pores that allow the passage of water and, in some family members, small solutes such as glycerol, play critical roles in regulating various skin parameters. 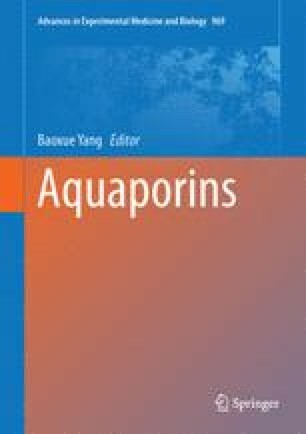 The involvement of different aquaporin family members in skin function is discussed. We would like to express our sincere appreciation for the talented Ms. Lynsey Ekema, MSMI, for preparation of Figs. 11.1 and 11.5. We also acknowledge the expert technical assistance of Ms. Purnima Merai for isolation and culture of primary cultures of mouse epidermal keratinocytes. WBB has been supported by a VA Research Career Scientist Award. The contents of this article do not represent the views of the Department of Veterans Affairs or the United States Government.